1 Gift Pack of Inspirational Goodies. This is a lovely gift for children and adults alike or perfect for selling for fund raising. 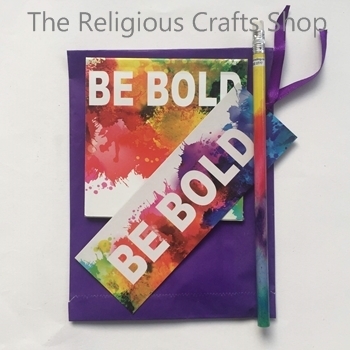 Each bag contains a bookmark with ribbon, pencil and note pad with an inspirational word. All are packaged in a gift bag measuring 18cm by 13cm.